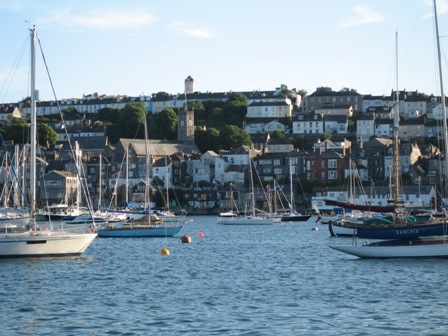 On July 9th, after a very exciting night of sailing we landed in Falmouth, England. Marco and I were both looking forward to finally meet our new friends from sea face to face. 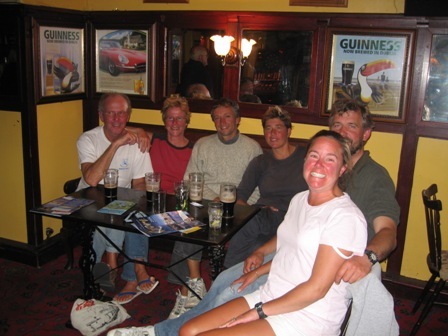 When all 3 of our boats were finally safe in harbor, the 6 of us headed to the nearest pub to have a cold one and watch the finals in the World Cup between Italy and France. Falmouth Harbor from our mooring. (Left to right) Frank and Marijke from Sepia, Andre' and Ester from Sandettie and Marco and I catching the World Cup Soccer game and having a few well deserved cold ones. Marco and I walked around the town of Falmouth quite a bit during our stay. We saw this house and just had to take this picture. Here we were all worried about leaving the beautiful weather in the Azores and going to rainy England. But here in England the weather has been beautiful. If you didn't know any better this picture could of been taken in the Azores. The extreme tides were always a concern during this trip. 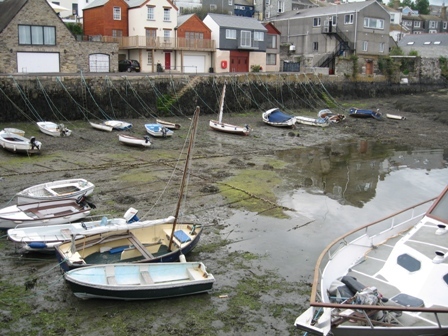 Here in Falmouth the tidal range was about 14 feet. 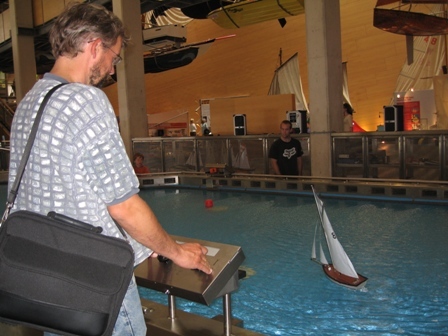 You really have to be plan carefully when anchoring and navigating. One of Marco's and my favorite books is Endurance. We were so excited to be able to go to the Maritime Museum in Falmouth where there was a fantastic exhibit about Ernest Shackleton's expedition aboard Endurance. In 1916, Sir Ernest Shackleton ship was crushed in ice pack forcing them to abandon ship, walk miles across ice fields, and finally sail this lifeboat 800 miles across the violent seas of the Southern Ocean. This voyage saved the lives of the 27 men on his Endurance expedition. 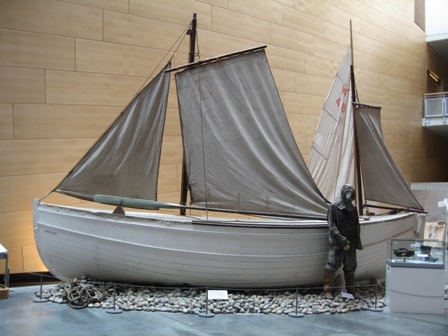 The James Caird was brought back to England in 1919 to celebrate this extraordinary story of survival. Marco just can't get enough of sailing. He will sail any sized boat!!! 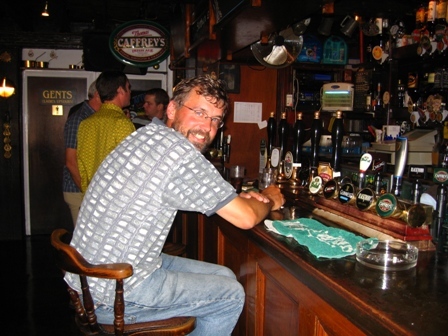 In Falmouth there were a couple of internet cafes and bars. It was so nice to be in contact with our friends and family again. The emails we get are really fun and we look so forward to checking our email at every port. This was the best spot however. 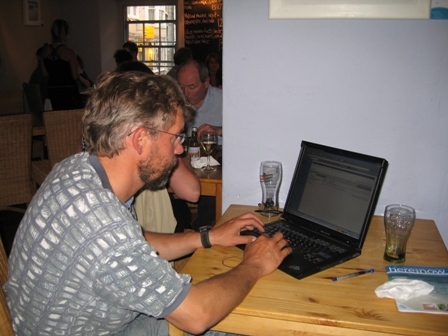 Not only could you check your email, you could have a cold one and dinner also. Got to like that!! 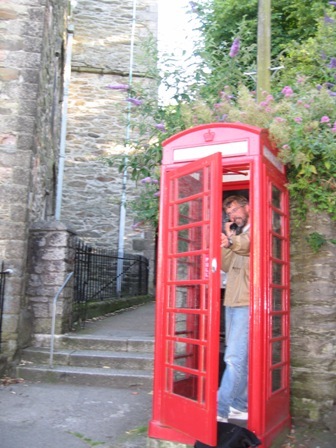 Local alternative to the satellite telephone. Marco headed for the nearest pub once in Plymouth to find out what bands were playing where and to taste the local beers. 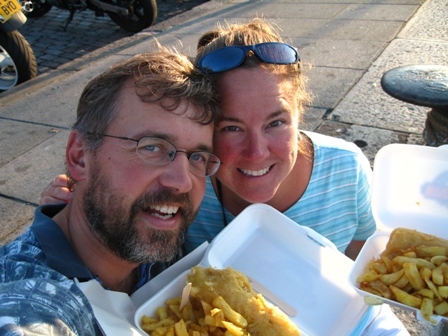 We have eaten our share of Fish and Chips. 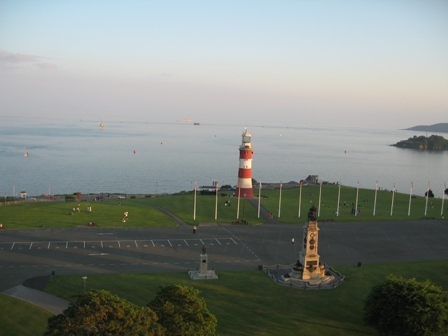 The view of Plymouth from the Hoe, a waterfront area in Plymouth. It was a beautiful park that had a Ferris wheel, a war memorial, and incredible views of the bay and town. This hole in Marco's shirt is not a sign that we have truly turned into castaways. I actually ripped his shirt. 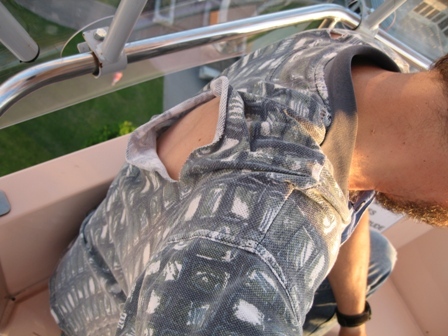 I had convinced Marco to ride the Ferris Wheel with me and once we got to the top to the Ferris Wheel they stopped it for us to get a great view of the area. Marco decided to stand up in the car, and as it started to swing a little, I freaked out. I pulled on his shirt and ripped it. OOPS!! So much for not being afraid of heights, and I am the one that skydives. Go figure. View from the Ferris Wheel of Plymouth Harbor. 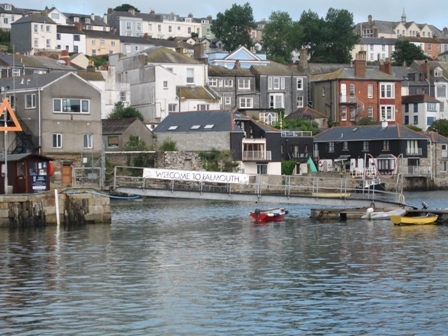 We landed in Dartmouth on July 14th and the plan was to stay only one evening but once we saw how absolutely beautiful the harbor and town was and heard the weather forecast we decided to stay for a couple more nights. My sister Wendy and her family met us the next day and we explored together. It was such a great time to be able to share some of our experiences with Wendy, Mark and the kids. We arrived in Dartmouth just before sun set. 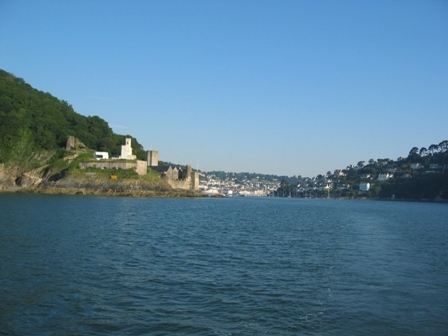 As we sailed from the ocean into the River Dart there were 2 castles present on the port and starboard side of the entrance. It was quite a awesome site. Dartmouth Castle at the entrance of the River Dart. 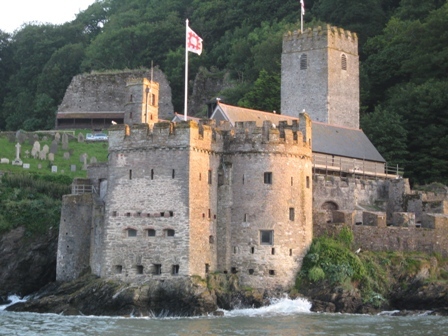 This is a 15th century castle and is just one of four defenses built on the site to help defend Dartmouth from attackers. The wall on the upper left hand part of the picture is the remains of John Hawley's 14th century castle wall. In fact, Chaucer used John Hawley as the model for the "Shipman" in the Canterbury Tales. 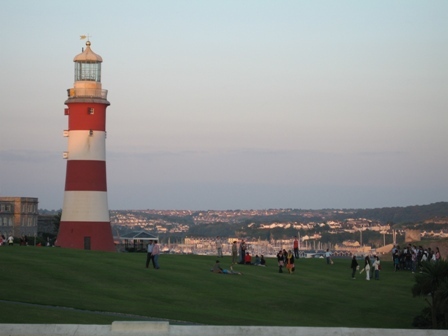 The tower that you see in the upper right hand corner is called St. Lawrence's Tower and was a Napoleonic lookout.. 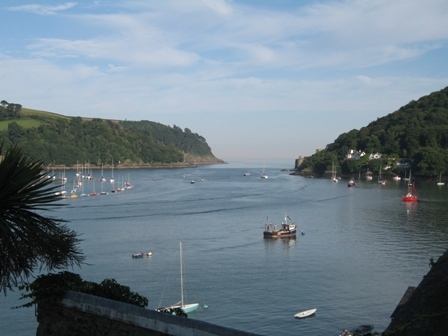 The River Dart and the entrance from the Atlantic Ocean in the foreground. 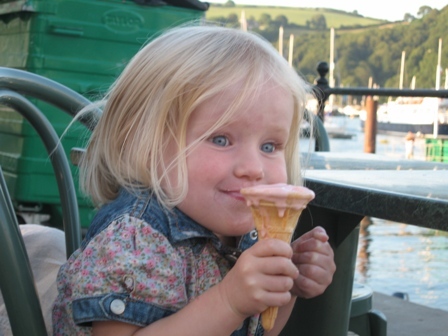 My niece Innogen enjoying a ice cream in Dartmouth. What a cutie!! 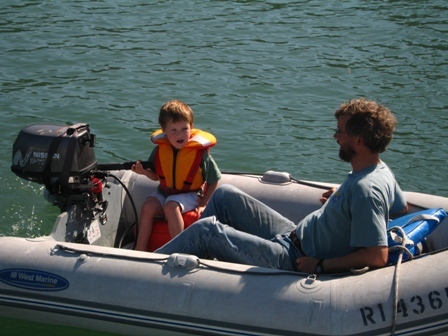 Once Ethan proved himself on the dingy, Marco gave Dalliance's helm over to Ethan. You can't start them too soon!! 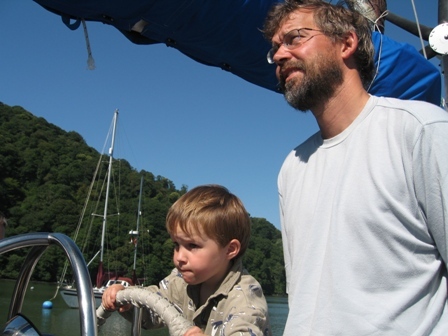 After leaving Dartmouth, on July 18th, Marco and I sailed an overnighter to reach Brighton, England. What I should actually say is that we motored to Brighton overnight. There was no wind but there was a full moon so we decided to go for it. 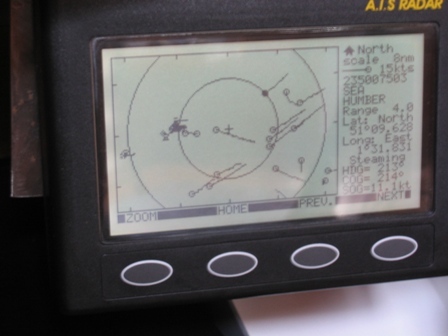 When the sun was down, the AIS showed that the Queen Mary II was off our starboard side. It was an amazing sight to see all lit up. It looked like a city on the sea. Later that same evening there were reports of flares being seen on the VHF and Marco thought he had seen them as well. After many calls to and from the Coast Guard and a fly by from a helicopter it was later announced that there was a meteor shower taking place and that was what we were seeing. It made for a very exciting night. Early on the afternoon of the 19th we landed in Brighton Marina. The harbor is entirely artificial, and was built to seaward of what had always been known as Black Rock. The Queen of England opened it in 1979 and it has become a popular sailing destination ever since. The facilities at Brighton Marina include a fitness center, 24-hour bowling alley, a gigantic grocery store (owned by Wal-Mart) and many restaurants from McDonalds to fine Italian. We did not stay on the boat in Brighton but went and spent 4 great days in Ardingly with Wendy, Mark and the kids. It was really nice to just hang out, take long hot showers and just relax. Ardingly, is only about 30 minutes away from Brighton and is a beautiful little village. Wendy has many friends in the village and one of them, Lisa, let me use her sewing machine so I could repair our spinnaker that we blew out earlier in the trip. Thanks Lisa and Adrian for all your help. Here is a picture of Marco and Ethan at Brighton Marina. 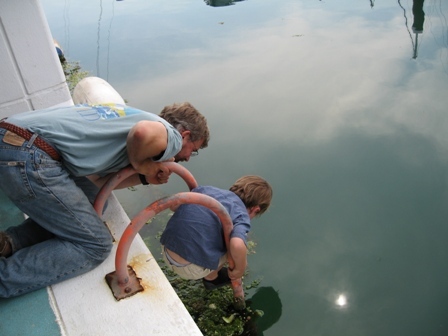 There was all kinds of sea life along the walls of the docks and they both were determined to catch a shrimp. I was sure one of them was going to end up going for a swim, which may not of been a bad thing. While we were in England they were experiencing a record heat wave where the temperature was the highest recorded in July in England in 100 years. 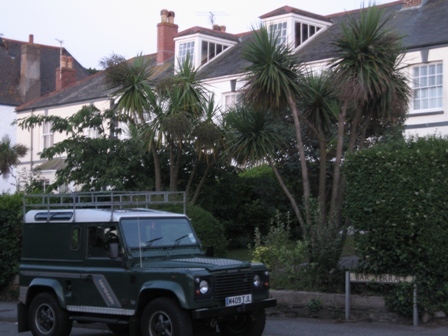 On July 22nd we had to leave Wendy's beautiful home and prepare to shove off again to head for Dover where we would cross the English Channel. Wendy, Mark and the kids hung out at the marina while I went to the mega grocery store to stock up on food and Marco refueled the diesel tanks. When I returned from the grocery store Marco came over and gave me a huge kiss and said, HAPPY ANNIVERSARY!!! I had completely forgot that it was our 5th wedding anniversary. I felt like such a schmuck and I couldn't believe that Marco remembered and I didn't. Later that evening after we said teary goodbyes to Wen, Mark and the kids I asked Marco how he remembered it was our anniversary. He finally fessed up, after looking so good for hours, that mom and dad had sent a SMS message on the satellite phone to wish us Happy Anniversary. So I wasn't the only one to have forgotten. We both have really lost track of the days of the week during this trip. As Marco likes to say, "Every day is a Saturday." 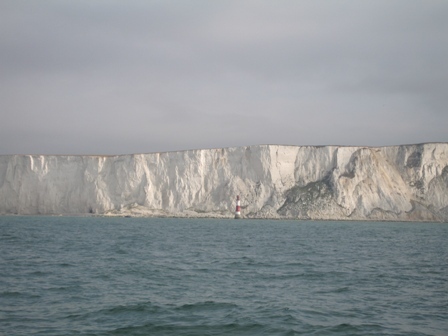 Its proximity to the European mainland makes Dover the leading port for departure when crossing the English Channel. This is the narrowest area of the Channel and directly across Dover is Calais, France. Upon arrival you have to hail the Dover Port Control before entering the port. It is really like a airport terminal. There was a constant flow of ferries coming in and out of the harbor and port control keeps track of the large and small boats arriving a departing. 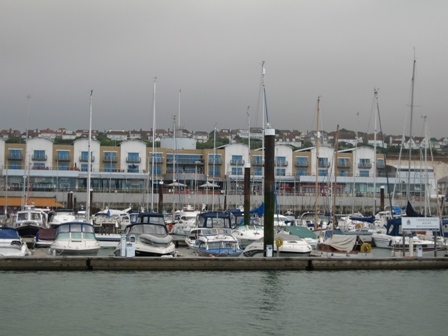 Once we got clearance to enter the harbor we headed for the marina and strolled into the town of Dover. Once in the marina the enthusiasm that the Dutch have for sailing became clear. Almost all the sailing vessels in the marina were flying the Dutch flag. Dover Castle, positioned on top of the high cliffs has helped defend the town since 1198, when Henry II first built the keep up until WWII, when it was used as the command post for the Dunkerque evacuation. Since before leaving Rhode Island for this trip Marco and I have both been intimidated thinking of crossing the English Channel. It is the worlds busiest traffic channel and to add to all of the traffic, the current can really whip you along. There is also a traffic separation scheme that is clearly marked on the passage charts. It's purpose is to prevent big-ship collisions in areas of heavy traffic. When crossing the channel you may only cross the separation zone at a 90°, or right angles. We both said we would only attempt to cross the channel when the conditions were perfect. So, having said that, we ended up turning back into Dover after our first attempt. Once we left Dover and approached the Channel and separation scheme there was a dense fog bank in the middle of the Channel. It was even written up in the newspaper because it stretched all the way from the northern part of Holland to Calais, France. So we ended up back in Dover for another night and just dropped anchor and tried again the next day. We were both glad we ended up waiting because the next day on July 25th we ended up having a great time crossing the Channel and landed in Nieuwport, Belgium at 1915 hrs that same evening. The AIS says it all about how much traffic there is in the English Channel. The cargo ship that is highlighted is Sea Humber and the captain changed his course for us and steered to our stern. 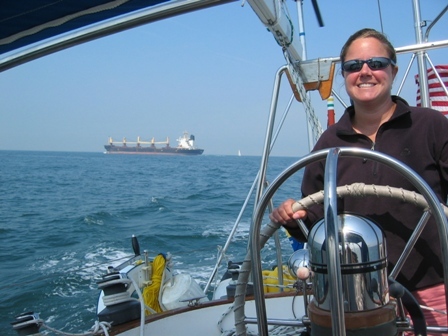 The picture of me sailing and the cargo ship behind me is the Sea Humber. Thanks Captain!! !